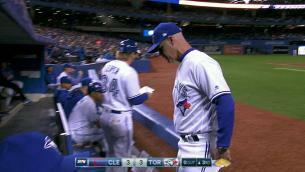 HP Umpire Vic Carapazza ejected Blue Jays Pitching Coach Pete Walker (balls/strikes) in the top of the 3rd inning of the Indians-Blue Jays game. With none out and none on, Blue Jays pitcher Francisco Liriano walked Indians batters Carlos Santana and Edwin Encarnacion. Replays indicate that of the 10 callable pitches ruled "Ball" to all four Indians batters in the top of the 3rd preceding ejection, all 10 were properly officiated (10/10 = 100% Accuracy), the call was correct. At the time of the ejection, the game was tied, 3-3. The Blue Jays ultimately won the contest, 8-7. This is Vic Carapazza (19)'s second ejection of the 2017 MLB regular season. Vic Carapazza now has 11 points in the UEFL Standings (7 Previous + 2 MLB + 2 Correct Call = 11). This is the 33rd ejection report of 2017. This is Toronto's 4th ejection of 2017, 1st in the AL East (TOR 4; BAL, TB 3; BOS 2; NYY 1). This is Pete Walker's first ejection since April 26, 2014 (Jeff Kellogg; QOC = Y [Balls/Strikes]). This is Vic Carapazza's 2nd ejection of 2017, 1st since May 8 (John Gibbons; QOC = Y [Obstruction]). Wrap: Cleveland Indians vs. Toronto Blue Jays, 5/10/17 | Video via "Read More"